. 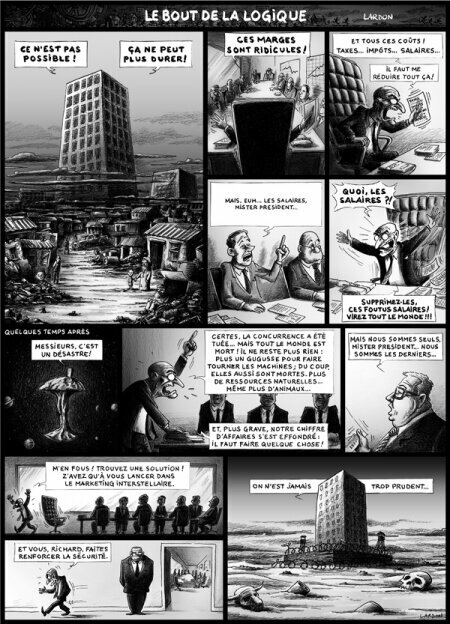 Sans action forte et rapide, le développement économique de l’humanité engendrerait des risques de perturbations majeures dans ce siècle et dans le siècle suivant d’une ampleur comparable à celles qui ont été associées aux grandes guerres et à la dépression économique de la première moitié du XXe siècle. Autrement dit, ramenés à une annuité constante, les dommages climatiques pourraient représenter de 5 à 20 % du Produit mondial brut (PMB) annuel dès aujourd’hui et pour l’éternité. La Californie, qui subit les assauts d'une forte tempête, ont rapporté plusieurs médias mardi. La plupart des zones affectées par ces coulées de boue ont été dévastées en décembre par l'incendie "Thomas", le plus destructeur en surface brûlée de l'histoire de la Californie. Il n'y a désormais plus de végétation pour absorber l'eau et retenir les sols. Sitting in a tarpee erected outside the Capitol Building in the US state of Washington, seven Indigenous women and their supporters have vowed to stay put.They will stay until they are either arrested or politicians take action on climate change and native treaty rights. / Assis dans une tarpée érigée à l'extérieur du Capitole dans l'État américain de Washington, sept femmes autochtones et leurs partisans ont juré de rester sur place. Elles resteront jusqu'à ce qu'elles soient arrêtées ou que les politiciens agissent sur le changement climatique et les droits autochtones. / Sentados en un toldo erigido frente al edificio del Capitolio en el estado estadounidense de Washington, siete mujeres indígenas y sus seguidores han prometido quedarse. Se quedarán hasta que sean arrestados o los políticos tomen medidas contra el cambio climático y los derechos de los tratados nativos. "We will be here as long as they let us be here," said Eva, a member of Santee Sioux Tribe. "Today, this is all we have left," she told Al Jazeera by phone. "We've been taken from and taken from. "/ "Nous serons ici aussi longtemps qu'ils nous laisseront", a déclaré Eva, membre de Santee Sioux Tribe. "Aujourd'hui, c'est tout ce qui nous reste", a-t-elle déclaré à Al Jazeera par téléphone. "Nous avons été pris et pris de." 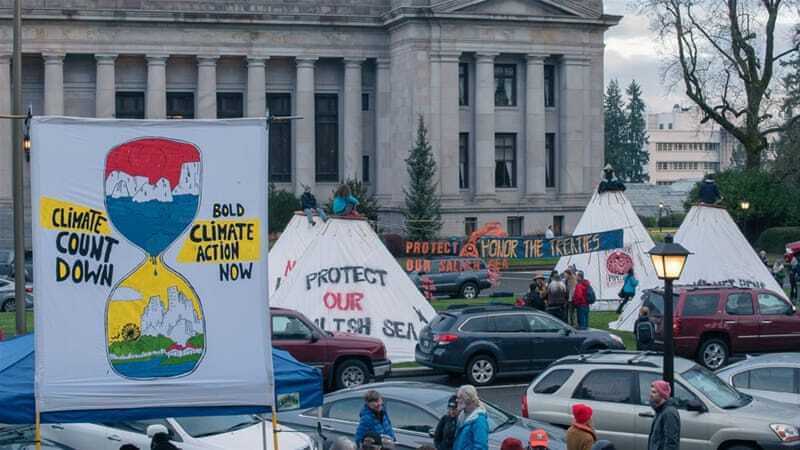 Eva, along with others from the indigenous community and their supporters, "occupied" the front lawn of the state capital in the city of Olympia on Monday, the first day of a new 60-day legislative session. "While they're inside doing their talks for the next 60 days, [we hope] they come to understand that the native nations people are watching them," Eva said. "We are outside and we are not leaving until you guys [politicians] understand that we don't want fracked gas factories … [or] coal mining. We want them out." The group is demanding that Washington Governor Jay Inslee take a stronger stance against the expansion of the Kinder Morgan Trans Mountain pipeline, which carries oil from the Alberta tar sands to terminals and refineries in British Columbia, on Canada's west coast, and the northern part of Washington state.Indigenous and environmental rights groups say the pipeline threatens native sovereignty and puts wildlife, as well as the land and sea along the route, at risk.Inslee has expressed "serious concerns" about the pipeline project, but the group says it is not enough. The women also called on the governor to respect native treaty rights and stop the use of fish farms. "It takes something like this for our voice to be heard," said Janene Hampton, who was among the women in the tarpee - a type of teepee - on Monday night. We're here in our native structure facing a colonial structure behind us. I find this to be beautifully symbolic of the indigenous matriarchy facing down the patriarchy. According to Eva, police had initially demanded that they remove the four tarpees that had been erected earlier in the day. But after occupying the space, negotiating and presenting the text of the Medicine Creek treaty of 1854 - which guarantees hunting and fishing rights to nine nations in the northwestern part of the US - the seven women were eventually allowed to stay, Eva said. "We're here in our native structure facing a colonial structure behind us," Fran Tatu, a member of the Metis Nation who is occupying the space, told Al Jazeera. "I find this [the occupation] to be beautifully symbolic of the indigenous matriarchy facing down the patriarchy," Tatu said. Tara Lee, the governor's deputy communications director, told Al Jazeera in an email on Tuesday that Inslee "greatly respects treaty rights and [his team believes] that the tribal governments in Washington and the governor have a productive government-to-government relationship". Lee added that the governor's chief of staff met with the protesters, but no treaty was presented and the governor's office "did not agree to let them stay". "The structure they have erected is not allowed and if it is not removed they will be arrested for trespassing," Lee said. Washington state police did not respond to Al Jazeera's request for comment. As well as the tarpee sit-in, a simultaneous protest by climate activists was taking place inside the Capitol Building. "We're in a climate crisis," one side of activists chanted as they interrupted the opening ceremony for the legislature. "You need to act now," the other side responded. The "Climate Countdown" campaign protesters were escorted outside, where they continued to rally with about 300 others. 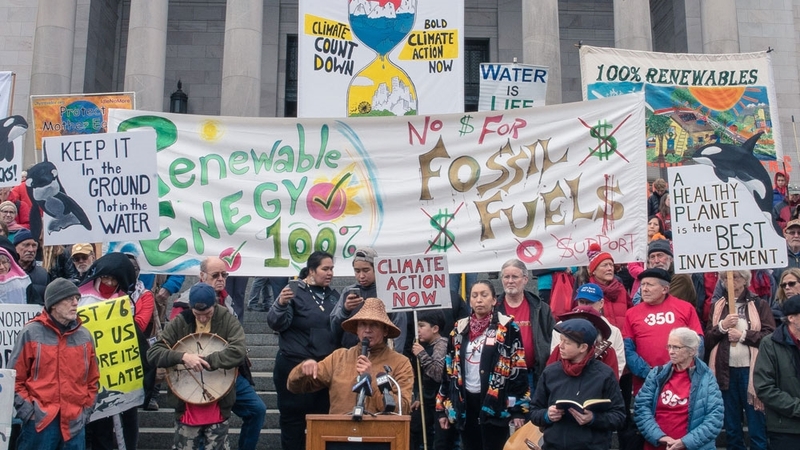 "You have 60 days to act like we're in a climate emergency and pass legislation ending fossil fuel infrastructure and transitioning Washington state [to] 100 percent renewables," 350 Seattle, one of the organising groups, told legislators on Facebook. Valerie Costa, an organiser with 350 Seattle, wants to stress the sense of "urgency" in addressing climate change. "Now is the time to take action," Costa said. "We want to show them [politicians] that we will be holding them accountable." Costa explained that in the face of setbacks by US President Donald Trump's administration in addressing climate change, leaders in the West Coast state have taken a stand and expressed their commitment to reducing greenhouse gas emissions. After Trump announced he was withdrawing the US from landmark Paris Agreement last year, Washington's Inslee and other governors formed the US Climate Alliance aimed at upholding the climate accord and "taking aggressive action on climate change". But according to Costa, politicians must act by also passing legislation aimed at stopping fossil fuel projects and committing to reduce the state's carbon footprint. "Washington state is seen as a leader on climate policy," Costa said. "The state needs to do more to earn that reputation." Halting the construction of the Puget Sound Energy (PSE) liquified natural gas (LNG) facility in the city of Tacoma is a priority for climate activists and indigenous groups in the state. According to 350 Seattle and the Puyallup Tribe, whose reservation sits near the proposed facility's site, the company has not obtained the necessary permits, and the facility puts the tribe's water and fish at risk. "Every single fossil fuel project has needed grassroots resistance for them not to succeed," Costa said. "[It's] only happened with a tremendous amount of work." Back in the tarpee, the group of indigenous women said they will continue their occupation. According to Eva, police said they would give the group an "ultimatum" on Tuesday, addressing if they can stay. "We are holding this space and the reason that us seven women this is a women-led indigenous movement," Eva said. "It's also a women's movement. "This is about lives - not only our lives, but the future lives of our children and our grandchildren and when it comes down to that."